Home » Challenges » Banish the Panda with Undereye Concealers – Whats your fave? Banish the Panda with Undereye Concealers – Whats your fave? I’m still searching for a concealer which work for me, I have quite severe dark eye circle/eye bag. Can you recommend or tell which is the best concealer so far with full coverage? I presently have 4 under eye concealers in rotation and I think they are all pretty decent stuff so it was a good idea to showcase them all together. They are listed in order of coverage. A recent discovery and a new love. I picked it up during the last L’oreal warehouse sale for RM60 which I thought was pretty pricey at the time. It usually retails for RM121 for 15ml. The tube is short and squat and you only need very little. I use Beige Pastel the lightest shade which has very slight pink tones. Its a little thick in texture so what I do is squeeze out a tiny drop on the back of my hand and warm it up with my fingers, then pat it on the under eye area. I find that it covers up my shadows nicely and evenly, does not sink into any lines and once dusted with a touch of loose powder lasts me the whole day and then some! It dries to a slightly matte powdery finish which I like. If you can find a color match in this line, its worth taking a look. 15ml will last me… well… forever! LOL… I use this for days when I have visible dark circles because it works to cover it up nicely leaving me looking pretty much flawless! This is already a staple in my makeup kit. Needless to say, this one was the first thing I reached for this morning! 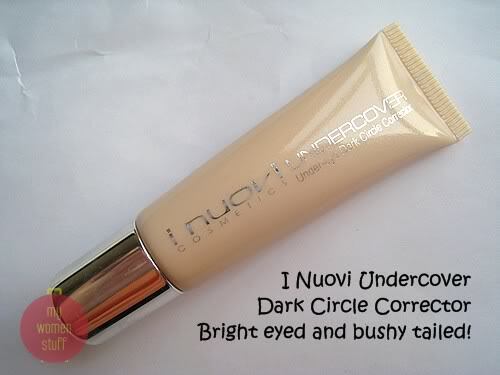 Many readers seemed to have picked up on my rave on the I Nuovi Undercover Concealer in an earlier post. Its good, make no mistake! 🙂 The texture is slightly more liquid so I can take it straight off the tube and onto my under eye area without having it look cakey. Its also got a little shimmer in it that brightens up the eye area. Sometimes we don’t need thick concealers when dealing with very dark circles because something slightly lighter that reflects light can help too. The colour I have is 2Y which is one of the lightest and it has a little pink tone. It suits me though. There are other colour shades in the collection which I recommend you to check out in person before buying. There is minimal fading for me throughout the day and I use this for days when I have lighter circles because it just works better then. I have this one in #1, the lightest shade. It comes in 2 shades only for now and coverage is pretty good. However, the colour tone is yellow which scared me initially. The texture is quite thick, slightly less so than the Lancome Effercernes so I use it the same way – dab a dot on the back of my hand, warm it up and dab it on. Applied lightly, the yellow tones aren’t as obvious though I can’t layer it on or I’d look like a reverse panda – yellow circles instead of dark circles! So, if you have yellow undertones to your skin and have trouble finding an under eye concealer that doesn’t look pink or white on you, you might want to consider this one. Coverage is decent and there is no light reflecting. It lasts though. I previously reviewed this one and I’m still not as happy with this as I should be – its the same tube btw. I was using this concealer for a while as I’d bought it and did not have other options. The colour is a good match for me but the coverage is a little thin, I feel. There is some light reflecting qualities and it works for light circles – if you have very dark circles, this one won’t work very well. Texture is light and I can pat it straight onto my under eye area without it caking or settling. It doesn’t last as long as the others though. My first and least favourite under eye concealer for now. 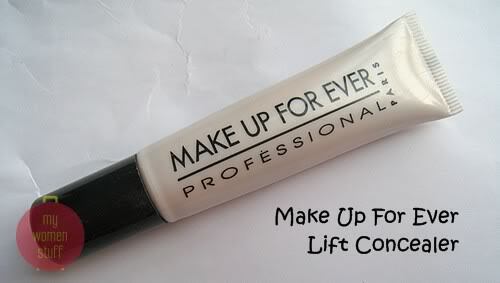 For seriously full coverage, thus far its Make Up For Ever Full Cover concealer for me. Even if I find that its not been doing a very good job with coverage lately, its still the best I’ve tried for now. I use it only for facial blemishes as I find it too thick for the under eye area. Some reviews I’ve come across online do report using it on dark undereye circles with great success so my suggestion is to try it out and see. My daily concealer is Neutrogena 3-1 Concealer, which is not available in MY. It’s cheap, and it works. My fav is still Bobbi Brown concealer though. Can you advice on how you ‘warm up the concealer with your fingers’ ? my favorite concealer will be the I Nuovi Undercover Undereye Concealer. Previously, I was using The Body Shop concealer but it’s really not a good one. After reading, ParisB reviews on I Nuovi concealer I rushed to the nearest I Nuovi counter and got myself one. I love the texture, love the brightening effect although it can’t hide my severe dark circles and it’s never settle into lines. I have to agree with everything you said about the I Nuovi concealer – its pretty awesome and the brightening effect is quite something too! Thank you for sharing.. This is a useful post!! I’ve seen the YSL undereye concealer that you are referring to in action before I think. My friend and I were shopping for makeup for our ball and we stopped by the YSL counter. The salesperson was extremely friendly and helpfull and highly recomended the ‘magic stick’ (as she referred to it as. lol) for my friend who has heavy eye bags and even helped to demonstrate the product directly on her. It was absolutely amazing. The brightening qualities it had was the best I have ever seen. We were terribly tempted to purchase it. If only the price was a little more student friendly T_T. But we did walk away with eyeshadows and concealers in the end. I swear the day I earn enough I must get that magic stick! You mean the YSL Touche Eclat I guess… I am also searching for a concealer right now. But all those that I’ve tested on my hands just don’t make me happy. =((( So I never buy them, and I have never used concealer before… even though I need one for my dark eye circles. A magic stick! Reckon its like Harry Potter’s wand? 😀 I’d love to try it though – maybe the next time I go duty free. Glad you enjoyed your shopping anyway – you must both have looked awesome at the ball! I apply concealer only if I remember too. nothing covers eye bags anyway! >.< I have the I Nuovi one and it's pretty decent but too fluid for me. I'm currently testing out Estee Lauder illuminizer brush pen thingy… liking it so far. I still think missha perfect concealer gives the best coverage. but it can accentuate lines. The Lancome one sounds like quite the gem! I’m using Laura Mercier secret camoflague concealer … but the best I’ve used is Boiing by Benefit – really thick and somewhat cakey but it really conceals everything! Thanks for your input! I started with Boi-ing but then the color ended up too dark for me 🙁 I’m between colors so its too expensive to buy 2 and blend! full cover is my love and hate. when it wants to work, it works. when it has a bad mood, it plays up big time. i think i am going to give lancome a try. for some reason, that looks good. my recent love is Lumiere Cremay Concealer in Medlum, the bomb for the moment. Oho! A cheap and good rec. Will take a look and see if any colours suit me. Thanks. I bought this Skin Food concealer in natural color (another one is fair color) but it didn’t work well for me 🙁 it’s cheap indeed but can’t really cover up my severe dark circle. still searching for a concealer that can work on me. I went to Sasa counter and tried I Nuovi with high hope after reading the positive review from ParisB but sad to say that it’s a bit too thin for me. tried Red Earth too, it’s better than I Nuovi in my opinion. not yet buy it as I’m still searching for the best one. ;p oh ya yesterday I tried BB too (with the assistance from beauty consultant) but I’m not really satisfied with the outcome. sigh. I am using I Nuovi’s and so far it works well even on the darker circles. I tried Boi-ing from my Primpcess set, and love it as well, not only covers my dark circles but also makes my under-eye area somewhat brighter. Glad to know Boi-ing works for you. Wish I wasn’t between shades!! I am currently using Stila Illuminating concealer which i bought during the move-out sales. It has good coverage, semi-matte finish and non-oily which is perfect for my normal-to-oily skin. I am using it everyday in the morning if I use make up and i dab onto my eyelids as well cuz I discover that my eye make up will not crease! It gives my eyes a fresh look and I’m loving it. PB, do the brands you mentioned above have colors for Indian skin tones? My current concealer is Bobbi Brown and it does a halfway decent job although i have to use two colors to get the desired effect. Big boo to companies that have limited color choices! When will they learn? If you are dark skinned, I don’t think any of the brands I mentioned have very dark shades. However, if you are latte colored you might find a match in Lancome or Make Up For Ever. I’m not sure about I Nuovi. 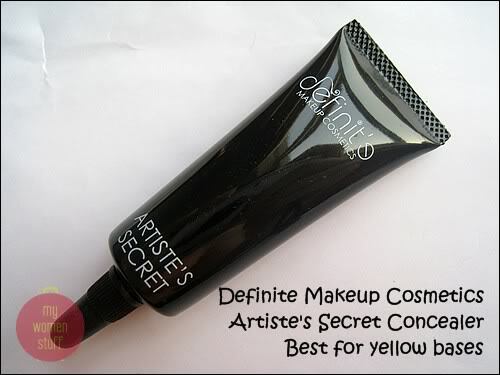 Definite Cosmetics only has 2 shades both of which are yellow toned. That said, you could find a match there too if the shade suits you. I am trialing a Napolean Perdis set now and its doing a pretty decent job! NYX concealer in a jar is okay but I need something with heavier pigmentation. 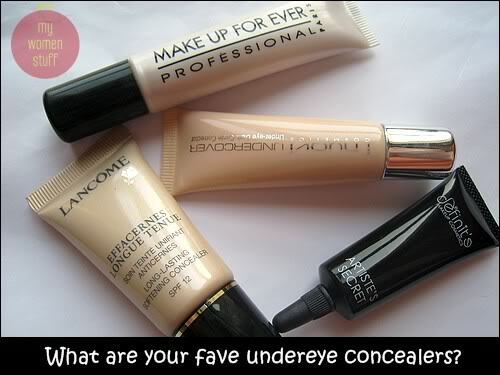 I can’t live without undereye concealers too! Bobbi Brown Creamy Concealer is my everyday concealer. I’ve been using it for almost 2 years now and it’s so far my favourite. I also use Benefit Erase Paste as undereye brightener. Oho! I’d forgotten about Revlon Age Defying Concealer! Its pretty awesome stuff – only snag is that it only comes in 2 shades but yeah thanks for reminding me 😀 I couldn’t get Erase Paste to work – too pink! Hey Ms B! Touche Eclat is really worth trying out – it works very similarly to the iNouvi – hides and brightens. I can’t live without my GloMinerals GloCamouflage Oil-Free cream concealer. It starts out a little thick, but spreads out nicely after a little warming out. Fantastic coverage. 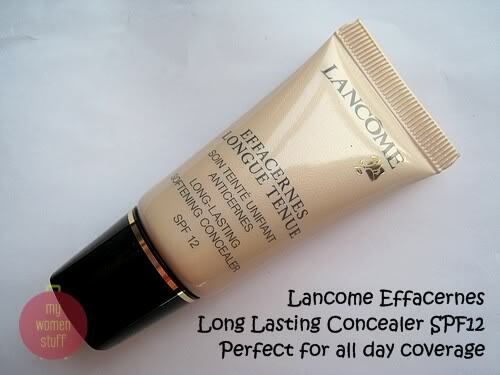 I like Lancome’s Long-Lasting Concealer too. Ooh I haven’t used this one too! I’m learning so much! 😀 I must agree that cream concealers cover better because they are thicker. Liquid can’t quite cut it sometimes. Glad you’ve found one that works for you! YSL Touche Eclat as corrector and Bobbi Brown eye concealor on top and finished with it’s powder. Perfect coverage till end of the day and it brightens up my face immediately. Ooh sounds like a winning combination! That’s another vote for Touche Eclat right there!